1. Create prime real estate for mugs with a rack stand. They allow us to drink coffee, and therefore deserve only the best. Mugs do not belong in overcrowded cabinets, mmkay? Get it from Amazon for $19.87. 2. Keep your favorite musical instruments out of the way with this heavy duty organizer. Perfect for larger pans. Pots and pans: are they cooking necessities, or are they drums? You decide. 3. Give your fruits a three-tier basket so they feel like they're in the Caribbean. Lounging in hammocks. Sipping cocktails. Much cheaper than an all-inclusive trip. Get it from Amazon for $28.87. 4. Abolish all "where the hell do I put this?" thoughts via this cabinet organizer. Perfect for miscellaneous kitchen products. Never say "where should I put this cutting board?" again! 5. Grab a sandwhich bag without knocking over condiments, spices, and bags of flour. How? This handy dandy wrap stand. Raise your hand if you're currently storing sandwich bags, aluminum foil, and wax paper on top of random cans. I cannot be the only one. 6. A mounted stemware holder that deserves a champagne toast. And luckily, your glasses are right there in preparation! An easy way to keep your ~fancy~ glasses in sight, but not in your damn way. 7. Turn your home into Starbucks with this coffee caddy. And in your at-home Starbucks? Let's just say your name is safe. "No one misspells my name in my own house!" 9. Install an under-the-cabinet hook and get a surprise appearance by none other than Gwen Stefani. 11. Clear up a ~bountiful~ amount of countertop space by using a wall mount for your paper towels. Unfortunately, not cat-proof. Promising review: "I've never been so excited about a home purchase. After reading a TON of reviews on paper towel holders (when did I become this person?!? ), I decided to buy this one. The arm has thin metal rods sticking out that hold the roll in place, so when you pull it, it doesn't pull fifty towels off at the same time. 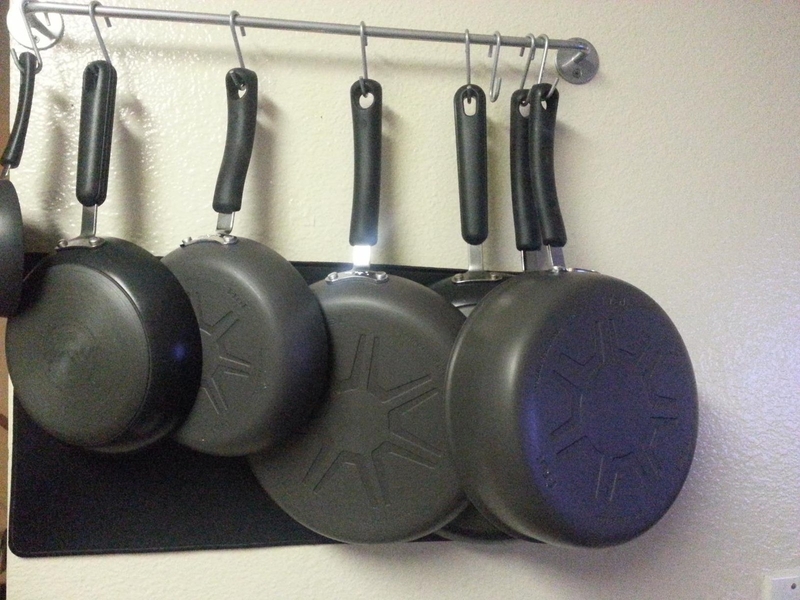 It looks great in my kitchen and, like I said, I'm really happy with this purchase." —Valerie J. 12. Turn your wall into storage with this wall rail. It comes with hooks to store all your Mrs. Potts and Peter Pans. 13. Provide egg-cellent protection for your favorite breakfast food with this nifty clear holder. "I like eggs [and their holders]" —Debbie in THE GIRL'S ROOM!!!! Get it from Amazon for $11.89 (holds 21 eggs, smaller sizes available). 14. Help your sponges upgrade from their outdated Bikini Bottom pineapple to this luxurious suction cup sink caddy. Only a brisk five-minute walk to the closest Goofy Goober. Get it from Amazon for $7.89 (available in four colors). 15. 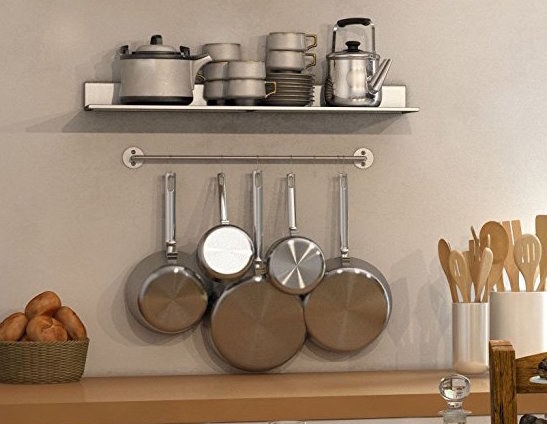 Congratulate yourself with a two-tier dish rack equipped with a drainboard and cutlery storage. Goodbye, excess water! Why do you deserve a congratulations? For washing the dishes! DUH! 16. Prove you have the Muffin Man on speed dial by using an adjustable bakeware rack. You know, the one from Drury Lane? You basically turn into a baker when you actually know where all your baking supplies are. This is a fact. 17. Let your kitchen scream "WINE O'CLOCK" á la this iron storage rack. Because it is always time for pinot, people. 18. Utilize every inch of cabinet space with a three-tier corner shelf that even Patrick Swayze wouldn't get upset over. "No one puts Baby in a corner! But the shelves are okay!" —Patrick Swayze in Dirty Dancing. 19. Get rid of the pain and suffering caused by bulky lids. This over-the-cabinet organizer actually gives them a place to stay. And no, I'm not being overdramatic. There is nothing worse than trying to find a place to store these damn things!! 20. This pull-down rack tells you the exact location of all your spices. Sporty, Posh, Scary, Baby, and Ginger included. 21. Stop shoving large utensils into spaces designated for forks and spoons. Be responsible. Use this stainless steel holder instead. **I would like to live in a world that still calls soda, "soda pop". 23. And finally, an organizer set that'll help you clean up your junk cabinet AKA the junk drawer of your kitchen. Promising review: "What a great buy—we moved into a place with less cabinet space, and this set works well! Overall, very satisfied and no issues with quality." —Anna M.
Get it from Amazon for $16.03 (includes three helper shelves, one spice rack, one wrap rack, and one sorter). SWEDISH CHEF IS THE BEST MUPPETS CHARACTER, okay?